If you’re the kind of person who likes truly unique fast cars and procreation, your options can be limited when it comes to combining your two passions. Yes, you can get M cars, RS cars, and AMGs, but they’re all faster versions of already existing cars. Maybe you want something that was designed from the off as a fast car and adapted to suit your needs, not a slow car turned fast. 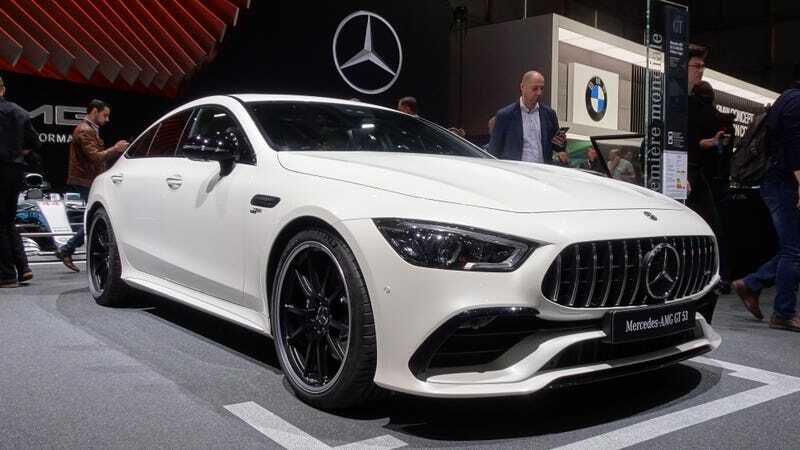 You’re in luck with the new Mercedes-AMG GT 4-Door Coupe then. I’m a fan, and evidently I’m not alone. Here at Geneva, the shiny Merc is drawing quite a crowd. So much of one, in fact, that even getting near the damn thing is difficult. The 63 and 63S were swarmed with people, so much so that getting any semblance of clean picture or even a look at them was never going to happen. Cameras, cameraphones, videographers, people just gawping all surrounded them and never seemed to leave a gap for new spectators to join in. The smaller engined inline-six hybrid 53 was tucked a little further away and wasn’t quite as busy, but as the pictures should show, getting a clean shot wasn’t going to happen. If you can’t beat them, join them, and all that. So I decided to stand in the way and have a good look around. The rear of the car, in white, is a bit awkward—it absorbs the show’s light and it can look flat form some angles. The front is hugely imposing and will be something you’ll get out of the way of on the motorway, that’s for sure. Inside it’s standard Mercedes. Lots of screens, lots of tech, lots of pretty. But also full of people who were selectively deaf to the phrase “excuse me.” The AMG GT Four Door is now high on my list of things to drive. What I did learn, other than the fact that pretty much everyone wants to stare at every small detail of the thing, is that the doors are amazingly light. A good thing.